You are currently browsing the category archive for the ‘saints’ category. 24 Now a Jew named Apollos, a native of Alexandria, came to Ephesus. He was an eloquent man, competent in the Scriptures. 25 He had been instructed in the way of the Lord. And being fervent in spirit,[a] he spoke and taught accurately the things concerning Jesus, though he knew only the baptism of John. 26 He began to speak boldly in the synagogue, but when Priscilla and Aquila heard him, they took him aside and explained to him the way of God more accurately. 27 And when he wished to cross to Achaia, the brothers encouraged him and wrote to the disciples to welcome him. When he arrived, he greatly helped those who through grace had believed, 28 for he powerfully refuted the Jews in public, showing by the Scriptures that the Christ was Jesus. Last week’s passage was about Paul’s return to Caesarea, probably Jerusalem — although St Luke, the author of Acts, did not say — and then on to the churches in Syria and Asia Minor that he had founded. Meanwhile, Paul’s friends from Corinth — Priscilla and Aquila — were ministering in Ephesus (Efes in Turkey). During that time, Apollos, a learned Jew from Alexandria (Egypt) arrived in the port city. He was very well spoken and knew his Scripture equally well (verse 24). Both Matthew Henry and John MacArthur state that Alexandria had a large Jewish population. MacArthur says that there were four different Jewish districts in the city. there were abundance of Jews in that city, since the dispersion of the people, as it was foretold (Deuteronomy 28:68): The Lord shall bring thee into Egypt again. His name was not Apollo, the name of one of the heathen gods, but Apollos, some think the same with Apelles, Romans 16:10. He was a man of excellent good parts, and well fitted for public service. He was an eloquent man, and mighty in the scriptures of the Old Testament, in the knowledge of which he was, as a Jew, brought up. (1.) He had a great command of language: he was an eloquent man; he was aner logios–a prudent man, so some; a learned man, so others; historiarum peritus–a good historian, which is an excellent qualification for the ministry: he was one that could speak well, so it properly signifies; he was an oracle of a man; he was famous for speaking pertinently and closely, fully and fluently, upon any subject. (2.) He had a great command of scripture-language, and this was the eloquence he was remarkable for. He came to Ephesus, being mighty in the scriptures, so the words are placed; having an excellent faculty of expounding scripture, he came to Ephesus, which was a public place, to trade with that talent, for the honour of God and the good of many. He was not only ready in the scriptures, able to quote texts off-hand, and repeat them, and tell you where to find them … He understood the sense and meaning of them, he knew how to make use of them and to apply them, how to reason out of the scriptures, and to reason strongly; a convincing, commanding, confirming power went along with all his expositions and applications of the scripture. It is probable he had given proof of his knowledge of the scriptures, and his abilities in them, in many synagogues of the Jews. Apollos was a Messianic Jew, one who knew of the Messiah’s imminent coming as prophesied by John the Baptist (verse 25). There were many followers of John the Baptist who evangelised his prophecy throughout the ancient world. Whoever taught Apollos did so carefully and accurately. Many of John the Baptist’s followers who evangelised did not know that much about Jesus’s ministry or that He died on the Cross, rose from the dead and ascended into Heaven. (Had John the Baptist lived, they would have.) Apollos was one of these people. Note that verse 25’s words, ‘fervent in spirit’, carry an explanatory footnote: ‘Or “in the Spirit”‘. On this point, our two commentators disagree somewhat. Though he had not the miraculous gifts of the Spirit, as the apostles had, he made use of the gifts he had; for the dispensation of the Spirit, whatever the measure of it is, is given to every man to profit withal. And our Savior, by a parable, designed to teach his ministers that though they had but one talent they must not bury that … He was a lively affectionate preacher; as he had a good head, so he had a good heart; he was fervent in Spirit. He had in him a great deal of divine fire as well as divine light, was burning as well as shining. He was full of zeal for the glory of God, and the salvation of precious souls. This appeared both in his forwardness to preach when he was called to it by the rulers of the synagogue, and in his fervency in his preaching. He preached as one in earnest, and that had his heart in his work. What a happy composition was here! Many are fervent in spirit, but are weak in knowledge, in scripture-knowledge–have far to seek for proper words and are full of improper ones; and, on the other hand, many are eloquent enough, and mighty in the scriptures, and learned, and judicious, but they have no life or fervency. Here was a complete man of God, thoroughly furnished for his work; both eloquent and fervent, full both of divine knowledge and of divine affections. He was a powerful man in terms of teaching. And let me just say at this point that his power at this point was the natural. He was not a Christian at this point, so consequently, did not have the indwelling Holy Spirit. So the power in his life was expressed really through his natural abilities, not yet having the Gifts of the Spirit as we know them. Later on, when he comes to Christ and he receives the Holy Spirit and gets the Gift of the Spirit in those areas, I mean, he becomes so devastating … But in this point, in the natural–and by that, I don’t mean that the Spirit didn’t touch his life, because nobody can know anything apart from the Holy Spirit, right, in any dispensation. So, I’m not disqualifying the Spirit. He had the Spirit’s work in his life in a very general sense, not in the specific sense of the Gift and the indwelling that the New Testament Saint knows. But he could, in his own natural ability, speak and communicate and was learned in the Old Testament. And believe me, it didn’t take him long to make an impression. Priscilla and Aquila heard him speak in the synagogue and understood that he did not have the story of Jesus Christ as Paul had related it to them. So, they took him to one side and explained it to him, as they had been taught (verse 26). MacArthur thinks they might have shared a meal with him followed by a long discussion about the life of Jesus and how He fulfilled Scripture. [2.] See an instance of truly Christian charity in Aquila and Priscilla; they did good according to their ability. Aquila, though a man of great knowledge, yet did no undertake to speak in the synagogue, because he had not such gifts for public work as Apollos had; but he furnished Apollos with matter, and then left him to clothe it with acceptable words. Instructing young Christians and young ministers privately in conversation, who mean well, and perform well, as far as they go, is a piece of very good service, both to them and to the church. [3.] See an instance of great humility in Apollos. He was a very bright young man, of great parts and learning, newly come from the university, a popular preacher, and one mightily cried up and followed; and yet, finding that Aquila and Priscilla were judicious serious Christians, that could speak intelligently and experimentally of the things of God, though they were but mechanics, poor tent-makers, he was glad to receive instructions from them, to be shown by them his defects and mistakes, and to have his mistakes rectified by them, and his deficiencies made up. Young scholars may gain a great deal by converse with old Christians, as young students in the law may by old practitioners. Apollos, though he was instructed in the way of the Lord, did not rest in the knowledge he had attained, nor thought he understood Christianity as well as any man (which proud conceited young men are apt to do), but was willing to have it expounded to him more perfectly. Those that know much should covet to know more, and what they know to know it better, pressing forward towards perfection. They told him the fullness of the facts regarding Christ. Oh, man, there’s the conversion of Apollos right there in those verses. And the Spirit doesn’t say much about it. Why? Because it wasn’t much of a change. He was already a saint. Here is an instance of a good woman, though not permitted to speak in the church or in the synagogue, yet doing good with the knowledge God had given her in private converse. Paul will have the aged women to be teachers of good things Titus 2:3,4. It is thought that Priscilla had more spiritual depth than her husband Aquila, which is probably why Luke put her name before his so often. Apollos decided to go to Achaia, so the men from the church in Ephesus sent a letter of introduction (verse 27). Achaia was the province where Corinth was located. Corinth was the centre of government for Achaia. Paul appeared before Achaia’s proconsul, Gallio. Luke did not state why Apollos wanted to go to Achaia, however, a few possibilities spring to mind. First, the Jews in Ephesus were largely receptive to Paul’s teaching, and Priscilla and Aquila were building a solid congregation there. Secondly, Corinth might have resembled Alexandria with regard to intellectual life. Thirdly, and most importantly, Apollos might have wanted to finish the job that Paul had started. Corinth still had Jews who were hostile to the Gospel message. When Apollos arrived in Achaia, his eloquence and precision reassured the converts (verse 27). Furthermore, he was also able to powerfully refute the errors of the Jews in scripturally demonstrating that Jesus is the Messiah (verse 28). Unbelievers were greatly mortified. Their objections were fully answered, the folly and sophistry of their arguments were discovered, so that they had nothing to say in defence of the opposition they made to the gospel; their mouths were stopped, and their faces filled with shame (Acts 18:28): He mightily convinced the Jews, and that publicly, before the people; he did it, eutonos–earnestly, and with a great deal of vehemence; he took pains to do it; his heart was upon it, as one that was truly desirous both to serve the cause of Christ and to save the souls of men. He did it effectually and to universal satisfaction. He did it levi negotio–with facility. The case was so plain, and the arguments were so strong on Christ’s side, that it was an easy matter to baffle all that the Jews could say against it. Though they were so fierce, yet their cause was so weak that he made nothing of their opposition. Now that which he aimed to convince them of was that Jesus is the Christ, that he is the Messiah promised to the fathers, who should come, and they were to look for not other. If the Jews were but convinced of this–that Jesus is Christ, even their own law would teach them to hear him. He was probably without equal as a speaker. You say, “Was he greater than Paul?” Well, very possibly. He was a greater preacher than Paul. Paul said to the Corinthians, in I Corinthians 2:1, “I, Brethren, when I came to you came not with excellency of speech.” Paul never did really value his preaching ability. Interesting. I don’t know if you ever read this verse. Interesting. II Corinthians 10:10, it says, “His letters say they are weighty and powerful, but his bodily presence is weak and his speech contemptible.” So he’s a lot better writer than he was a body, and he was an even better body than he was a speaker. Now, that’s a interesting little insight into the possibility that Paul perhaps was not as great an orator as was Apollos, and I’m only making the comparison because I want you to know the stature of this man. He was without peer, as far as we could see in the New Testament, as a preacher, as a speaker. Paul’s Epistle refers to a schism between four parties in the Corinthian church, of which two attached themselves to Paul and Apollos respectively, using their names (the third and fourth were Peter, identified as Cephas, and Jesus Christ himself). It is possible, though, that, as Msgr. Ronald Knox suggests, the parties were actually two, one claiming to follow Paul, the other claiming to follow Apollos. “It is surely probable that the adherents of St. Paul […] alleged in defence of his orthodoxy the fact that he was in full agreement with, and in some sense commissioned by, the Apostolic College. Hence ‘I am for Cephas’. […] What reply was the faction of Apollos to make? It devised an expedient which has been imitated by sectaries more than once in later times; appealed behind the Apostolic College itself to him from whom the Apostolic College derived its dignity; ‘I am for Christ. '” Paul states that the schism arose because of the Corinthians’ immaturity in faith. And such a holy man was he that later on when he saw the factions in Corinth, it so grieved his heart that in I Corinthians 16:12, Paul had asked him to go back and he wouldn’t go back to Corinth. The factions that came in Corinth weren’t Apollos’ fault any more than they were Peter’s fault, Paul’s fault or Christ’s fault. But they grieved him. Apollos is mentioned one more time in the New Testament. In the Epistle to Titus, the recipient is exhorted to “speed Zenas the lawyer and Apollos on their way”. Jerome states that Apollos was so dissatisfied with the division at Corinth that he retired to Crete with Zenas; and that once the schism had been healed by Paul’s letters to the Corinthians, Apollos returned to the city and became one of its elders. Less probable traditions assign to him the bishop of Duras, or of Iconium in Phrygia, or of Caesarea. Martin Luther and some modern scholars have proposed Apollos as the author of the Epistle to the Hebrews, rather than Paul or Barnabas. Both Apollos and Barnabas were Jewish Christians with sufficient intellectual authority. The Pulpit Commentary treats Apollos’ authorship of Hebrews as “generally believed”. Other than this, there are no known surviving texts attributed to Apollos. Hebrews is one of my favourite books in the New Testament. If Apollos wrote it, you will see — if you don’t already know — how persuasive and clear he was. 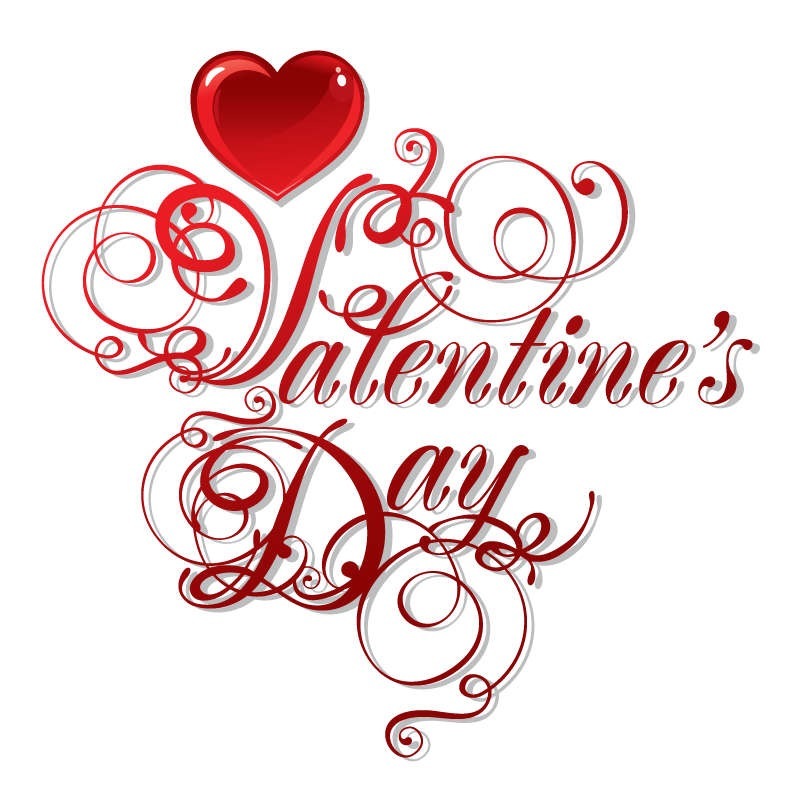 Lent starts on Valentine’s Day in 2018. May those of us observing this season have a spiritually enriched Lent. If you had a celebration today, I hope it was a pleasant treat before Christmas. Wow! I had no idea St Nicholas was so many things to so many different cultures. When I lived in Berlin Germany, I lived in the heart of the population… On the “economy” as it was called by military dependents! I loved the German people and their customs, and Christmas was a real treat for my family! We put our shoes out on the stoop for St Nicholas to stuff our shoes with sweet treats and trinkets, and sometimes there was a simple exchanging of gifts! But it was the neighborhood celebrations that we all enjoyed so much! The European Christmas with St Nicholas was so very different from our American Santa Claus, and Christmas was celebrated with neighbors, family, and friends! The cobblestone streets were filled with carolers and snow! Being from the South, it was the first time I had lived where it truly snowed!! Large beer wagons were filled with hay and people hopped aboard and caroled from the wagons as well! The “huge” horses were draped in jingle bells and they were braided in their mane and tails! The kids would get so excited when they heard them coming! For a country with a dwindling population, 40 years ago, Germany was all about celebrating the “family”… But now I hear it is so very different now. Thanks, sunnydaysall, for documenting a lovely memory — and for letting me share it here. If you have been reading my Forbidden Bible Verses series over the past few weeks, you are acquainted with Acts 10, starring St Peter and a Roman centurion named Cornelius. Acts 10 formally brought Gentiles into the Church, beginning with Cornelius, his family and friends. Cornelius was stationed in Caesarea and was part of the Italian Cohort (Acts 10:1). It is strange that, having attended Catholic schools for nearly all of my academic career, I never heard of Cornelius — until I read the Bible in its entirety a few years ago. I am not alone. Many Catholics have not heard of him. Angelo Stagnaro wrote an article for the National Catholic Register in February 2017. I highly recommend reading ‘What Do We Know About St Cornelius the Centurion?’ It’s factual as well as being witty and warm. Stagnaro opens by describing what happened at a Sons of Italy meeting he attended wherein the men and women assembled were thinking of a name for a new chapter of the organisation. The chapter had to be named after an Italian or an American with Italian ancestry. “How about St. Cornelius the Centurion?” I suggested. “Who’s he?” came back the reply. That’s not an uncommon question considering the Church has more than 17,000 saints and beati―no one could know all of them. So, I explained. “The first non-Jew to convert to Christianity was Italian,” I reiterated. “Where did you get this information? !” asked the group’s elected leader. “From the Bible,” I replied, surprised at the crowd’s reaction. Stagnaro read them Acts 10 from his tablet. … twenty people came up to me after the meeting to verify what they thought I had said. “Why didn’t anyone tell me this before? I know the feeling! I agree! How could it be? Back to the life of Cornelius now. There was a lot of information for St Luke to put into the Book of Acts, so we do not hear any more about the centurion after Acts 10. Cornelius was a centurion in the Roman Empire’s Cohors II Italica Civium Romanorum which was stationed in Caesarea, the capital of Roman Iudaea province, to keep the Pax Romana. Afterwards, Cornelius left the military service and followed the Apostles. St. Peter then ordained him a Bishop over the city of Caesarea of Palestine. He went there and proclaimed the Name of Christ, showing them the error of worshipping idols. Their minds were illuminated with the knowledge of God and they believed in Him. He strengthened them with the signs and miracles he performed before them and he baptized them all and among them was Demetrius the Governor. Then he departed in peace and received the crown of glory of the apostles. When the Apostle Peter, together with his helpers Saints Timothy and Cornelius, was in the city of Ephesus, he learned of a particularly vigorous idol-worship in the city of Skepsis. Lots were drawn to see who would go there, and Saint Cornelius was chosen. In the city lived a prince by the name of Demetrius, learned in the ancient Greek philosophy, hating Christianity and venerating the pagan gods, in particular Apollo and Zeus. Learning about the arrival of Saint Cornelius in the city, he immediately summoned him and asked him the reason for his coming. Saint Cornelius answered that he came to free him from the darkness of ignorance and lead him to knowledge of the True Light. The prince, not comprehending the meaning of what was said, became angry and demanded that he answer each of his questions. When Saint Cornelius explained that he served the Lord and that the reason for his coming was to announce the Truth, the prince became enraged and demanded that Cornelius offer sacrifice to the idols. There was an earthquake, and the temple of Zeus and the idols situated in it were destroyed. All the populace, seeing what had happened, were terrified. Demetrius was furious and had Cornelius imprisoned. One of Demetrius’s servants told him that his wife and child had perished under the temple rubble. Some time later, a pagan priest, Barbates, told Demetrius that his wife and child had survived and could be heard praising the Christian God. Demetrius, relieved and happy, rushed to the prison, said that he, too, believed in the one true God and freed Cornelius, asking him to try and rescue his family from the temple ruins. Cornelius went and prayed until Demetrius’s wife and child were able to emerge from the rubble. Saint Cornelius lived for a long time in this city, converted all the pagan inhabitants to Christ … Saint Cornelius died in old age and was buried not far from the pagan temple he destroyed. When Governor’s Island, New York, was a military installation the Episcopal Church maintained a stone chapel there dedicated to him. The Collect: O God, by your Spirit you called Cornelius the Centurion to be the first Christian among the Gentiles; Grant to your Church such a ready will to go where you send and to do what you command, that under your guidance it may welcome all who turn to you in love and faith, and proclaim the Gospel to all nations; through Jesus Christ our Lord, who lives and reigns with you and the Holy Spirit, one God, for ever and ever. Amen. The Epistle is Acts 10:1-18, which is the account of both Cornelius’s and Peter’s visions. Jesus went through one town and village after another, teaching as he made his way to Jerusalem. Someone asked him, “Lord, will only a few be saved?” He said to them, “Strive to enter through the narrow door; for many, I tell you, will try to enter and will not be able. When once the owner of the house has got up and shut the door, and you begin to stand outside and to knock at the door, saying, `Lord, open to us,’ then in reply he will say to you, `I do not know where you come from.’ Then you will begin to say, `We ate and drank with you, and you taught in our streets.’ But he will say, `I do not know where you come from; go away from me, all you evildoers!’ There will be weeping and gnashing of teeth when you see Abraham and Isaac and Jacob and all the prophets in the kingdom of God, and you yourselves thrown out. Then people will come from east and west, from north and south, and will eat in the kingdom of God. How often is it that people receive a heavenly visitation? The Scriptures seem to indicate that such events are reserved for those who have a very special calling from the Lord such as Moses, Gideon, Joseph and Mary, Zechariah, John the Baptist, Paul, etc. Another point worth considering is that Peter was the chief of the Apostles, yet the Lord didn’t think him too big or too busy, or too important to send to these lowly Gentile believers. In fact, the Lord specifically gave Peter his vision to convince him of the importance of his mission to Caesarea. The Lord knew that Cornelius and his family were an important part of His overall plans. Another fact to consider is that this family received the gift of the Holy Ghost. This is very important. I hope we remember Cornelius’s faithful devotion to God, which brought him into contact with Peter. I also hope we can draw inspiration from Cornelius’s example as a Christian. In this final instalment on St Peter‘s spiritual journey, what follows are excerpts from the other two blog posts from John MacArthur on this great Apostle. My other two in this series, based on MacArthur’s posts, are ‘John MacArthur on Peter’ and ‘John MacArthur on Peter’s leadership qualities’. MacArthur tells us that Jesus taught Peter a number of lessons, all of which helped his spiritual and apostolic development. He outlined these in ‘Peter: Learning from Life Experience’, excerpts from which follow. Emphases mine below. … the experiences—even the difficult ones—were all necessary to shape Peter into the man he needed to become. He backslid only once — and briefly — but the Apostle Paul sharply corrected him. The incident is in Galatians 2, discussed here. Sometimes the experiences were bitter, distressing, humiliating, and painful. Other times they were encouraging, uplifting, and perfectly glorious—such as when Peter saw Christ’s divine brilliance on the Mount of Transfiguration. Either way, Peter made the most of his experiences, gleaning from them lessons that helped make him the great leader he became. This account comes at a time when Jesus was returning with the twelve to Capernaum, their home base, after a period of itinerant ministry. A tax collector was in town making the rounds to collect the annual two-drachma tax from each person twenty years old or older. This was not a tax paid to Rome, but a tax paid for the upkeep of the temple. It was prescribed in Exodus 30:11–16 (cf. 2 Chronicles 24:9). The tax was equal to two days’ wages, so it was no small amount. That is a tall order to fulfil, especially when governments are tyrannical and employers unreasonable. MacArthur’s posts came at a serendipitous time, just as Peter’s great works and miracles are the subject of where I am in Acts (most recently here and here). Peter will be the dominant Apostle for the next few weeks. Let us remember MacArthur’s words of wisdom as we read more about this great saint in the weeks ahead. At the weekend, I wrote about Acts 9:36-43, the account of Peter raising Dorcas from the dead. Dorcas became a role model for charity, particularly for women. It is not unusual to find stained glass windows depicting her, especially in Anglican and Episcopal churches. The example on the left comes courtesy of Wikipedia and can be found in St. Michael’s Parish Church, Mytholmroyd, West Yorkshire. Dorcas Societies — Dorcas Circles in the US — exist today in many churches around the world. They are known not only for supplying clothes to the needy, which is what Dorcas did, but also food and practical help to those who need material assistance. Eastern Orthodox, Catholic, Anglican (including Episcopal) and Lutheran Churches celebrate her feast day on January 27 (Protestant) or October 25 (Eastern Orthodox and Catholic). The Catholic Church calls her St Tabitha. Protestants have a joint feast day remembering Dorcas, Lydia of Thyatira and Phoebe, two other notable women of the early Church — and the New Testament. That a widow who enjoys sufficiently robust health should spend her life in works of zeal and solicitude, keeping in mind the words of the Apostle and the example of Dorcas. She is also commemorated in poems by Robert Herrick (“The Widows’ Tears: Or, Dirge of Dorcas”) and George MacDonald (“Dorcas”) as well as in religious paintings. My post last year at this time discussed the life St Nicholas, legends associated with him and how the Dutch regard him. 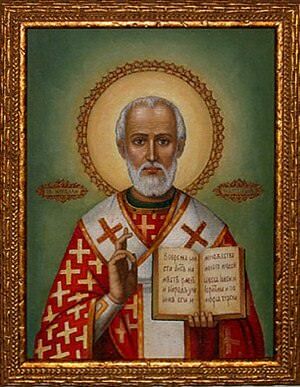 St Nicholas’s feast day is December 6 and a French website, L’Internaute, had an excellent article about him. A summary follows. St Nicholas became the patron saint of children thanks to the legends associated with him, which last year’s post explored. Most of them involved him rescuing young people: the poor man with three daughters, the three theological students or, as the French tell it, the three children who fell afoul of an evil butcher, and the boy from Myra kidnapped by pirates. As the Dutch have Black Pete as a companion to Nicholas, the French have the Bogeyman (Père Fouettard — fouetter means ‘to whip’). The French article says that in both cases, these two are alter-egos of the great bishop. There is the benevolent Nicholas who is kind to good children and the companion who punishes bad youngsters. Together, they mete out justice. It’s not hard to see how Nicholas made the transition into Father Christmas, or, as the Dutch say, Sinterklaas, giving rise to the American Santa Claus who arrives at the time of the Christ Child. Like the Dutch, the Belgians and a number of countries in Northern Europe, some French towns and cities hold local festivals on or near the time of St Nicholas Day. This is particularly true in the region of Lorraine in northeastern France. The celebrations have extra meaning there, because in the late Middle Ages, an imposing German nobleman by the name of Hans von Trotha ruled over the area. He had a nasty reputation as a robber baron and a defiler of young girls. Over time, his evil reputation was extended to frighten children in the region to be good or ‘Hans Trapp’ or ‘Hans Trott’ would give them a good beating. The threats worked, as Hans in real life was a tall, robust man. This year’s celebrations in eastern France are going ahead, despite the security threats. That said, authorities have forbidden firework displays because of the 2015 Paris attacks and the July 14 attack in Nice. In closing, St Nicholas is also the patron saint of sailors (another legend), prisoners, lawyers, physiotherapists and single men. Many years ago, my family and I attended St Stephen’s Church, one of many Catholic churches in the United States built by Hungarian immigrants in the late 19th and early 20th centuries. These Hungarian churches were named for the first of Hungary’s Christian kings. Stephen I took his name from the first martyr, Stephen, whose story is recorded in Acts 6 and 7. I wrote about the first St Stephen several years ago, whose feast day is December 26. To clarify: there are many other Catholic — as well as Episcopal and Lutheran — churches which bear the name St Stephen. Those are named for the aforementioned first martyr. However, when Hungarians founded parishes of the same name, most of those were honouring their first Christian king, still revered today. According to the traditional narratives, the commitment of Hungary to Europe has seemed secure throughout most of its history. 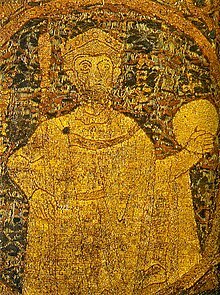 The coronation of the first Hungarian king, St Stephen, by the pope of Rome is usually portrayed as the symbol of a tribal people leaving behind their eastern pagan legacy. The bloody battles against the Tatar and then the Ottoman Turk invaders are often presented as the defence of Christian Europe by Hungary. To this day, Stephen is arguably the most popular name for Hungarian males, including those born outside of Hungary. I have known several. Devotion to St Stephen among Hungarians continued even during Communist rule, albeit underground. Because Stephen I lived during the Middle Ages, definitive records about certain details of his life are thin on the ground. Yet, enough facts exist to be able to put together a portrait of a devout Christian who was canonised within a century after his death. Before Stephen was crowned, the country had been ruled by a succession of Grand Princes of the Hungarians. Stephen was the last of those as well as the first king. He was born between 967 and 975 AD. Most historians settle on 975. He was given a pagan name at birth: Vajk. At some point, Stephen’s parents — Grand Prince Géza and his wife, Sarolt, — converted to Christianity and were baptised. They, in turn, had their only son Stephen baptised and renamed. After Stephen won decisively in the year 1000 with Koppány dying on the battlefield, Pope Sylvester II sent him a crown for his coronation, which took place either on December 25, 1000 or January 1, 1001. This crown (pictured at right) is known as the Holy Crown of Hungary and was used at more than 50 coronations until 1916. Stephen’s ceremony was conducted according to German coronation traditions. Notably, he was anointed with consecrated oil. This would legitimise his status among Christian rulers of other European countries and territories. Five years earlier, he had married Gisela of Bavaria, daughter of Henry the Wrangler, Duke of Bavaria, in 995. Tradition has it that Bishop Adalbert of Prague (St Adalbert, Bishop and Martyr) performed the ceremony in Bavaria at Scheyern Castle. This arranged alliance between the Duke of Bavaria’s and Stephen’s families would prove advantageous in the decades of wars to come. To that end, several of the Duke’s knights were given land in Hungary and settled there. From a religious perspective, as the Duke of Bavaria was related to Emperor Otto III of the Holy Roman Empire, Gisela would be a Christian wife and mother. Stephen would also use this Christian leverage to convert Hungary from paganism. Conversion became his primary priority soon after coronation. Interestingly, although he owed his future power to the Holy Roman Empire, Stephen wanted Hungary’s churches to be independent of — yet friendly with — it. Soon after his coronation, he established an archbishop’s position in Esztergom, which ensured this independence. The first archbishop was appointed either in 1001 or 1002, the year when Pannonhalma Archabbey was founded. Stephen invited foreign clergy to settle and evangelise in Hungary. Several who knew Bishop Adalbert, by then deceased, took him up on his invitation. Stephen’s contention for the faith and his reign’s legitimacy displeased many, including some family members. The young king knew his uncle Gyula The Younger and his family opposed him, so he invaded their homeland of Transylvania to seize the man and his family in 1002 or 1003. He soon converted the people of that region to Christianity by force and established the Diocese of Transylvania at the same time. Gyula later escaped and fled to safety with Boleslav the Brave in the neighbouring Duchy of Poland. After invading Transylvania, Stephen and his men occupied the lands ruled by Kean, Duke of the Bulgarians and Slavs in 1003. He also invaded Bulgaria in the 1010s. Some Hungarians were resistant to Stephen’s occupations and forceful conversions. The Hungarian tribes had long before been assigned a colour motif and region. Those in the west were given the colour white, those in the east blue, those in the south red and those in the north black. Hence, the Black Hungarians. To clarify: the colours were those used in their symbols, emblems and standards (flags), nothing to do with skin colour. The Black Hungarians had resisted conversion. Stephen conquered their land in 1009, and to make his intention clear, brought in a papal legate, Cardinal Azo, to seal the deal. The Bishopric of Pécs was established on August 23, 1009 by royal charter, which also delineated its boundaries. Stephen also created the Diocese of Eger in the same region. (The Diocese’s Wikipedia page says it was founded in 1000. Stephen I’s page says it was founded in 1009.) The people living in and around Eger are thought to have been Kabars, a Khazar tribe. Stephen made them and their chieftain convert to Christianity, hence the creation of the diocese. The chieftain’s family, the Abas, were influential in supporting Stephen’s Christian monarchy. Other Hungarian tribal clans also helped. With their support, Stephen was able to establish a network of Hungarian counties, each with a royal fortress which served as a county seat for matters economic and religious. The county seats quickly developed into market towns and economic centres. A warm relationship between Hungary and the Holy Roman Empire helped Stephen increase his territory. In 1018, the aforementioned Boleslav the Brave ceded his lands in the Morava Valley to the king. Relations with Otto Orseolo, the Doge of Venice, were also cordial. As Orseolo was related to the Byzantine Emperor Basil II, Hungary maintained friendly relations with that region, too. In fact, Stephen allied with Basil II in an invasion of the Balkan Peninsula to conquer the ‘barbarians’ in 1018. During the invasion of the Balkans, Stephen had been collecting saints’ relics, for which he had a plan. After his return to Hungary in 1018, he opened a new pilgrimage route near the old capital of Esztergom. This new route linked Hungary with Western Europe and the Holy Land. To provide pilgrims with a centre of worship, Stephen founded a grand, triple-naved basilica dedicated to the Holy Virgin in Székesfehérvár. He donated his relics from the Balkans to the basilica. He also set up a cathedral chapter there and declared the city his new capital. We do not normally think of the Middle Ages as a time of great international travel and communication. Yet, trade and pilgrimage routes had long been established across Europe, Asia, the Middle East and North Africa. “those who have returned from the shrine of our Lord” testify to the king’s passion “towards the honour of our divine religion”. Stephen met pilgrims personally, which helped to increase his fame. He invited some of them to settle in Hungary. Among them was Gerard, a Benedictine monk from the Republic of Venice. It seems he helped Stephen establish several Benedictine monasteries in Hungary between 1020 and 1026. In order to encourage Christians to make the pilgrimage to the Holy Land, Stephen founded four pilgrim hostels. They were located in Constantinople, Ravenna, Rome and Jerusalem. Stephen became so well known and loved across Europe that even his coinage was forged. People wanted to own something associated with him. He began issuing silver dinars in 1020, inscribed with STEPHANUS REX (‘King Stephen’) and REGIA CIVITAS (‘royal city’). Forgeries of those coins have been found as far away as Sweden. Gisela bore Stephen several sons. He outlived all of them. Emeric (pictured at left) was named after Henry II, Gisela’s brother. Henry II was Holy Roman Emperor between 1014 and 1024, the year of his death. Like Stephen, Henry II fought several of the same people in the same lands, albeit on a larger scale. He and his wife, the Empress Cunigunde, were very devout. Their marriage produced no children and some historians posit they were celibate for religious reasons. Henry was canonised in 1147 and Cunigunde in 1200. Emeric was born around 1007. In addition to religious and moral instruction from Stephen, Emeric also received much tutoring between the ages of 15 and 23 from the aforementioned Venetian monk Gerard. In 1022, Emeric married. The identity of his wife is still disputed. However, like his uncle Henry II and aunt Cunigunde, Emeric and his wife had a chaste marriage. By all accounts, Emeric was a saintly young man. It was to Hungarians’ sorrow that, on September 2, 1031, he was killed by a boar whilst hunting. Stephen and Gisela had Emeric buried in the basilica at Székesfehérvár. After his death, Stephen fell into ill health, from which he never recovered. His territorial and conversion battles over, Stephen devoted his life to Christian practice. He kept various vigils and washed the feet of paupers in his capital. Politically, Stephen was threatened without a direct successor. Historians dispute whether more than one plot was designed to depose him. His cousin Vasul, a suspected pagan, was thought to have launched an unsuccessful coup against him. Stephen died on August 15, 1038. Like Emeric, he was buried in the basilica at Székesfehérvár. His nephew, Peter Orseolo the Venetian, succeeded him. The next four decades were marked by civil wars, a partial return to paganism and foreign invasion. As a result, Gisela left Hungary in 1045 and returned to her native Bavaria. She became a nun and was Abbess of the Niedernburg Abbey in Passau by 1060. Peace and order only returned once Vasul’s grandson Ladislaus I ascended to the throne in 1077. During the intervening years, Emeric’s grave was the site of many wondrous healings and conversions. On November 5, 1083, Ladislaus I presided over a grand ceremony at the basilica at which Pope Gregory VII officiated. Emeric’s bones were unearthed for the occasion. Gregory VII canonised Emeric, Stephen and the monk — later Bishop — Gerard of Csanád. The statue in Székesfehérvár (pictured at right) shows Gerard of Csanád teaching Emeric. Those travelling to or sightseeing in Hungary will have much fascinating history to discover. Happy Boxing Day to readers living in countries where December 26 is a public holiday. December 26 is also the feast day of St Stephen, the first martyr. Concerning today’s illustration, a clearer, black and white version of George Cruikshank’s 19th century engraving can be seen at The History Notes. On the subject of Boxing Day, journalist Cameron Macphail wrote a fascinating and witty history of December 26 for The Telegraph. I highly recommend reading it in full. Boxing Day was observed in some sense — if not as a public holiday, then as a day of giving — going back at least a few centuries. In the 17th century, Samuel Pepys recorded Boxing Day preparations in his diary. Gift boxes were for servants and tradespeople. Servants worked on Christmas Day for their employers. Boxing Day was their day off and the opportunity to be with their own families. Employers gave each servant a box with a gift, bonus and, sometimes, Christmas leftovers. The first weekday after Christmas was also the time when customers gave a present or a sum of money — gratuity or account settlement — to tradespeople. St Stephen is the patron saint of horses. Macphail says this is why so many horse races and hunts are held on December 26. The Irish refer to December 26 as St Stephen’s Day rather than Boxing Day. On December 26, the British continue their Christmas celebrations with family activities. These include attending the theatre or participating in charity events. Football fixtures are played around the country. These used to take place on Christmas Day afternoon until the late 1970s, when they were thought to detract from spending the day together as family. In more recent years, Boxing Day is the date when post-Christmas sales begin. Whilst the men in the house can watch football, women can go to the shops. If December 26 falls on a Saturday or Sunday, the following Monday is always a public holiday in the UK and Ireland. This is the case in 2015. Boxing Day is also observed in Commonwealth countries such as Canada, South Africa, Hong Kong, Australia and New Zealand.